WORKDAY REGISTRATION IS CLOSED – PLEASE LOOK OUT FOR OUR MAY WORKDAY REGISTRATION COMING SOON! Come join us for our April workday along Sugar Creek! 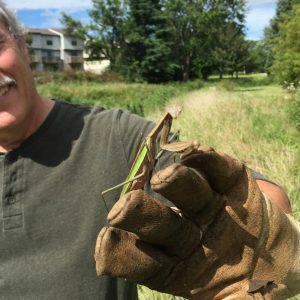 We need help improving Sugar Creek in designated areas throughout Bloomington and Normal, by clearing invasive plant species and managing the non-invasive plants. Volunteers must be 18 years old or older (or 14 and accompanied by a parent or guardian) and be able to hike along uneven terrain and safely use basic hand tools such as loppers and bow saws. Please dress appropriately for the weather and bring your own work gloves and (reusable) bottle of water. 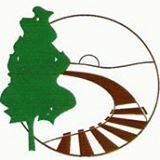 The Sugar Creek Stewards is part of the Ecology Action Center’s Clean Water programming, and is supported by the City of Bloomington and the Town of Normal. For more information, contact us. Details on worksite location will be provided to registered volunteers prior to the workday. To become a regular EAC volunteer and be automatically contacted for future Sugar Creek Steward workdays and other volunteer opportunities, register at EAC-Volunteer. Otherwise, please fill out the registration form below! 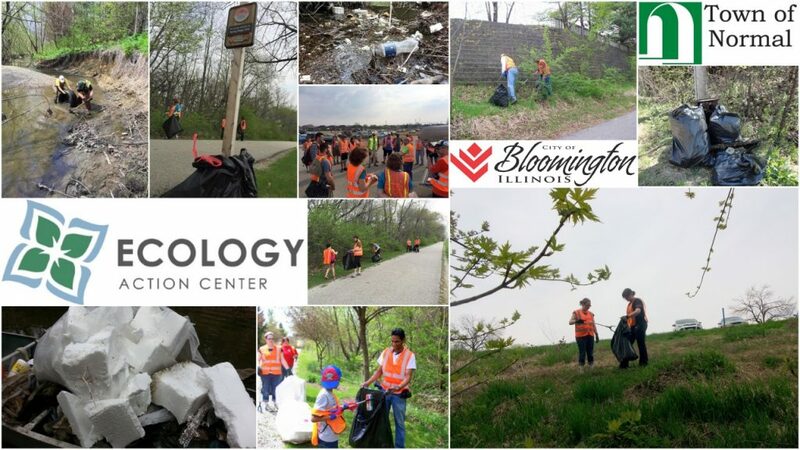 Help keep your community clean and healthy–celebrate Earth Day and help out with Bloomington-Normal Clean Up Week. 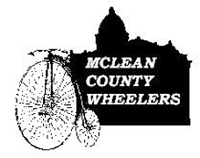 Volunteer with the Ecology Action Center, Bike BloNo, McLean County Wheelers, and Friends of the Constitution Trail to clean up along the Constitution Trail and Sugar Creek. Sign up to help using the volunteer form below. Minors must be accompanied by a parent or guardian. Dress appropriately for the weather and bring your own work gloves if possible. Trash bags will be provided. Please register using the form below to help us plan for appropriate numbers; refreshments will be provided at the end of the workday. In the sign up form, you will chose to work in one of two groups–either the group meeting at Tipton Park at 9 a.m. or the group meeting in the back parking lot behind the Chateau at 9 a.m.
Our Sugar Creek Stewards workday is also the morning of April 20th. The Sugar Creek Stewards work to improve the health of Sugar Creek as a storm water filtration system by removing invasive species and creating room for healthier native plants. If you’d like to volunteer there and help us remove invasive species and seed natives in areas we’ve already worked, you can sign up here! Volunteer sign up is now closed, we have reached capacity for this event. Thank you for your interest in volunteering–please join us another time! Registration for this workshop is FULL. Be on the lookout for our upcoming May workshop! Join us at our upcoming rain barrel workshop on Thursday, April 18, 2019 at 6:00 p.m., where YOU build your own water-saving rain water collection and storage container. Workshop prices are $45 ($35 EAC member price). A flexible plastic elbow to direct rain water from your downspout to your rain barrel. Fits 3″ downspouts. Workshop excludes installation materials for your specific home which may include concrete blocks, hacksaw, screwdriver, sheet metal screws, etc. The fine print: The construction process can get a bit messy so wear clothes that can get dirty. The barrels measure 25″ x 35″ and weigh 25 pounds. Bring an appropriate vehicle to transport your barrel home. 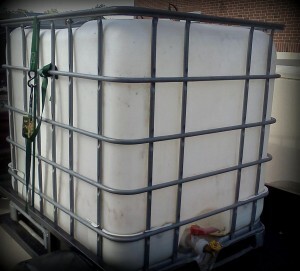 There is a limit of one rain barrel per household per workshop. For safety reasons, all participants must be 18 years or older. *Note: If you are interested in a 275 gallon mega rain harvester (measure about 4′ x 4′ x 4′ and weigh 50 pounds), we are not building 275-gallon mega rain harvesters in this workshop, but they are available for purchase and delivery. They are $100 or $90 for EAC supporters plus tax. We can also deliver in Bloomington-Normal for $25 and in the rest of McLean County for $50. Please contact the Ecology Action Center if you are interested in a mega rain harvester 309-454-3169.
International environmental activist, food sovereignty advocate, and feminist Vandana Shiva will present an address as part of the Adlai E. Stevenson Memorial Lecture Series at 7:30 p.m. Monday, April 15, in the Hansen Student Center at Illinois Wesleyan University. Her talk is titled “The Future of Food” and is free and open to the public. Dr. Shiva trained as a physicist at the University of Punjab, and earned her Ph.D. from the University of Western Ontario, Canada in 1978. She later shifted to interdisciplinary research in science, technology and environmental policy, which she carried out at the Indian Institute of Science and the Indian Institute of Management in Bangalore, India. The Adlai E. Stevenson Memorial Lecture Series was established by a group of local civic leaders to honor the legacy of Bloomington native Adlai E. Stevenson II, former Illinois Governor and U.S. Ambassador to the United Nations, after his passing in 1965. The events are co-hosted by Illinois Wesleyan University and Illinois State University. If you know of a public park that needs cleaning up, Normal Parks and Recreation Department and City of Bloomington Parks and Recreation will provide clean up supplies (trash bags, gloves). Please leave your collected trash next to an existing public trash receptacle if possible. If you know of a private property that needs cleaning up, first seek permission from the property owner. 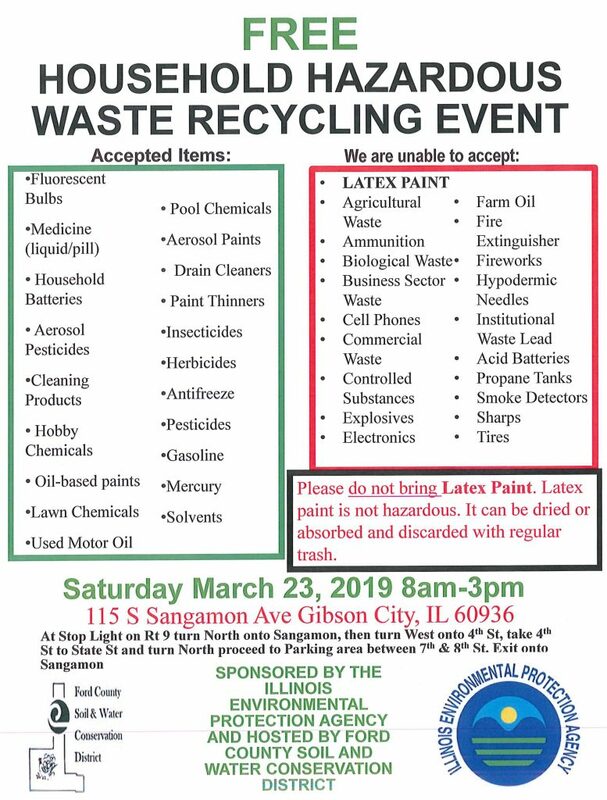 Then you can get trash bags and work gloves from Normal Parks and Recreation or City of Bloomington Parks and Recreation. You will need to make your own arrangments for disposal of the trash collected. 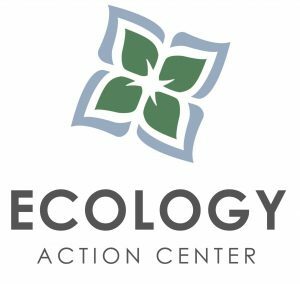 Sign up to volunteer for the Ecology Action Center’s Earth Day Clean Up on Saturday, April 20, 2019 from 9 a.m. until noon. Our clean up area is the Constitution Trail and Sugar Creek from Tipton Park west to Audubon Gardens. Sign up to receive full details on meeting locations and other instructions. Children under 18 allowed to participate if accompanied by a parent or guardian. For clean-up supplies, please contact Gene Kotlinski at Normal Parks and Recreation (454-9724 or [email protected]) or the City of Bloomington Parks and Recreation (434-2260). Normal Is Over (103’ min) is a compelling and visually rich documentary directed by investigative TV-journalist Renée Scheltema. Her award-winning film is about humanity’s wisest response to climate change, species extinction, the depletion of critical natural resources, income inequality and industrial control of our food production. This unique documentary examines how our economic and financial system connects all these issues, and offers solutions, which could be implemented immediately, from practical everyday fixes to rethinking the overarching myths of our time. Renée takes off on a multinational voyage, meeting not only prominent experts, but also everyday citizens who concentrate on matters such as organic agriculture, the banning of plastic, saving species, ecological economics, sustainable architecture, renewable energy, and more. While this film is intended to challenge viewers on many different levels, it most of all offers hope. Water is a crucial global resource, and water security is central to sustainable development. Thirsty Land discusses extreme drought, agriculture, and the water crisis in the Western United States and how these challenges impact farmers, communities, and the environment. We are thrilled to have Conrad Weaver, the film’s producer/director, joining us for the screening. He will be presenting after the film. We expect the screening to open a dialog about the far-reaching impact of this water crisis and how, as engaged and informed citizens, we should be aware of what can and should be done about it. 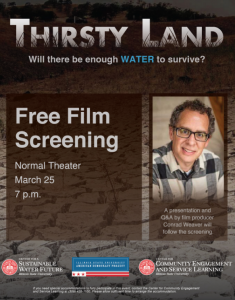 The screening is co-sponsored by the Center for a Sustainable Water Future, the American Democracy Project, and the Center for Community Engagement and Service Learning. We hope to see you on March 25 for this important film and discussion!